The decision to install a new swimming pool can be a very exciting prospect. A new pool can really expand the living area of your home by allowing for outdoor square footage that can be used during the day and even the evening time. People will want to come and spend time at your house so they can kick back and relax after a long workweek, so this new addition can be a fun social addition as well. The first thing to investigate is whether you have enough room to add a pool to your property. Perhaps you already full landscaping in your yard and it does not seem as though a new pool would fit. A qualified pool contractor can measure to see if a pool will fit, and if so, what type of shape and design will be best for the space you have to work with. If you do have a landscape design already set up, your contractor should be able to work with what you have to make your new addition flow with the foliage on the property. 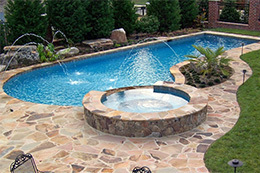 The most fun way to install a new in-ground pool is to incorporate landscaping in the pool design. You can transform your back yard into a small oasis where you can sit and relax after a stressful day. Certain bushes, trees and flowers can be planted to incorporate the pool into the landscaping, presenting in one cohesive unit. This can be done beautifully, so that it does not look like your new swimming pool was just dropped into your yard. Avoid a pool contractor who does not discuss landscaping options with you. It is also a good practice to make sure that your pool and new landscaping flow nicely with the architecture of your home. If your home is of Mediterranean inspiration, then perhaps some hardscaping is in order. Your contractor can add a rustic-looking wall, an intricate paver design or even a fountain to give your space a courtyard type appeal. If you have a modern, home why not consider an edgeless pool and complement it with Zen-like pavers and bold flora? The sky is the limit when you pair your creativity with the knowledge and experience of an experienced pool contractor. It is important to remember that you can incorporate whatever you want into your new backyard project. There are many variations of in-ground pools with different finishes, color schemes, and materials that can match any vision as well as your budget. Be sure to sit down with a licensed contractor so that together, you can devise ideas that will satisfy your creative desires without draining your pocketbook. This is an investment, not a cost. Gress Inc. creates pool designs in Raleigh, Durham, Cary, Apex, Greensboro, Wake Forest, Chapel Hill, Holly Springs, Fuquay Varina, New Hill, Pittsboro and Sanford.